You can find Angela here and here on Ravelry. I like to look for repetitive patterns in nature (for instance in cloud formations, wave patterns, plants, or animal markings) or in the decorative arts (sculpture, architectural details, mosaic tiles, or fabric prints) and re-interpret them as knitted motifs. My other main form of inspiration is stitch dictionaries; I must have over 20 in my knitting library. And I enjoy submitting designs to publishers who provide storyboards or mood boards along with their submission calls-- the pictures and descriptions on the boards will often point me in new creative directions. It depends on what I'm working on at any given time. Most recently I got very excited to discover that the duplicate stitch method of grafting allows seamless and perfect joining of even complicated stitch patterns (as long as both pieces were worked in the same direction, not in opposite directions). I love lace, cables and texture patterns. I really like the elasticity of ribbing, which makes it useful and (usually) flattering to wear, but knitting ribbing annoys me (1) because it's tedious and (2) because if the knit columns have more than 2 stitches, the left-hand edge stitches are always bigger than the others--try as I might, I have not been able to fix that. I look at other designers' work and I'm sure I'm sometimes influenced by it-- how could I not be? There are a lot of great designers out there, including more than a few with incredibly novel and exciting ideas (Norah Gaughan, Lynne Barr and Alice Starmore come to mind). But I try to use other designers' work as inspiration to come up with my own ideas and techniques. I wasn't really aware of this issue as a controversy, exactly. I do know that mainstream U.S. knitting magazines over the past few years have increasingly tended to spell out instructions to an extent that was not usually seen in the past, and is still not typical in other countries. I don't think "dumbing down" is an accurate or fair description of this. It is more an issue of making patterns accessible to novice as well as experienced knitters, and although I think you can go too far in spelling everything out, more experienced knitters should by definition be able to skip over instructions that they find unnecessary. Experienced knitters, remember you were once novices! I do wish sometimes that magazines would insert this disclaimer in appropriate places: "If after completing this section you find you are one or two stitches off, don't worry about it! It makes no difference to the finished garment." 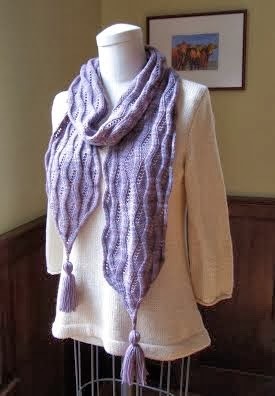 At the moment I have one sample knitter who knits some of my samples, but I am trying to find more. I don't have enough time to do all of my own sample knitting, and in fact I really should do more designing and less knitting, from a business point of view: as a hypothetical example, if I spend 10 hours swatching, sketching, putting together a spreadsheet and writing up a pattern, and 30 hours doing the actually knitting, and I make $400 for the pattern, then I've only earned $10 an hour, but if I hire a sample knitter and pay her $150 to do the knitting, then I've made $25 an hour. And yes, sample knitters are underpaid too! No, I just submit pattern ideas to as many venues as I can, and in the time I have left after doing deadline work, I self-publish as many designs as I can. 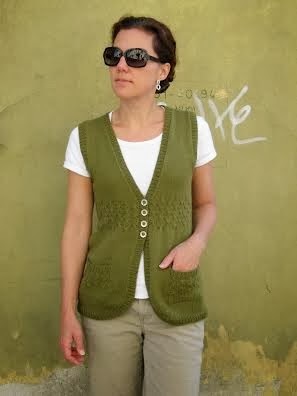 It has had a huge impact: I sell patterns online as PDF downloads via my website (www.knititude.com), as well as through Ravelry.com. Most pattern publishers will now accept email submissions (Interweave being an exception). And I communicate with customers and other knitters almost exclusively online. For my self-published patterns I do (although occasionally I will forego using a tech editor if the pattern is very simple). I have used several over the years. Even with a tech editor's help, errors can still slip through, but I feel better knowing that someone else has checked my work before publishing. I really like to work, and more often than not I have to make myself get up from the computer to go and participate in family life, exercise, or spend time with friends. 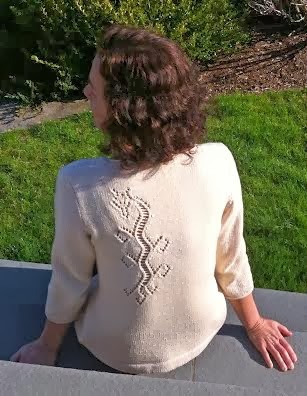 At least knitwear design has flexible hours and it's portable; my family and I travel a lot. And I get most of my actual knitting done while hanging out with the family and watching TV in the evenings. I've always been a big reader, so I also knit while reading (I love my book stand!). For me, the perfect amount of knitting is enough to keep my hands busy while watching my (few) favorite TV shows; when I have to start searching for more TV to watch, I know I'm knitting too much. I don't usually take it personally. Unless it's nasty (which is rare), I am able to stay detached enough to think about whether the criticizer may have a point. In a few cases, such as some recent heated comments about one of my designs on Ravelry, I did have to edit myself before I could respond calmly to the commenter. Of course that's easier when the criticism comes online and not in person. I am still far from being able to support myself with my earnings. 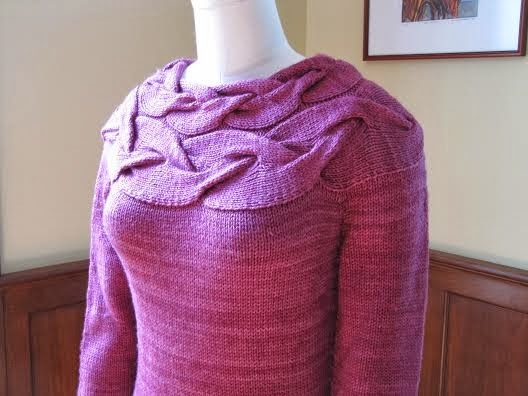 For the amount of work that goes into a knitting pattern, the average pay is really quite low (see answer to question about using sample knitters). That is why so many knitwear designers teach, lecture, or become associated with yarn companies as in-house designers or yarn consultants! It's hard to make a decent living as a knitwear designer, but you will be more likely to do so if you are organized AND if you find some good test knitters; you will be more productive and have fewer repetitive motion injuries, and less stress, if you don't try to knit everything you design! 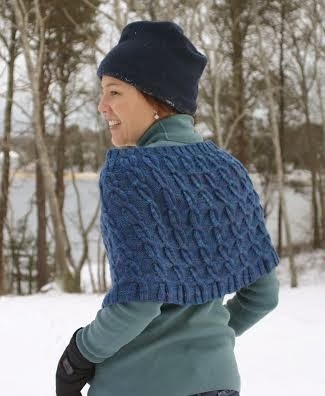 Whenever possible, save time by working out design issues using sketching, plotting on graph paper or calculating, rather than impatiently knitting away and thinking you will work things out as you go along. And finally, when you are knitting a prototype or swatch, write everything down as you go along (changes in stitch pattern, where you started, how you shaped)-- much easier than going back and trying to reverse-engineer what you did.